Release Date : Since October 12, 2009 on TV Tokyo in Japan. This show is based on the popular manga series of the same name by Hiro Mashima. 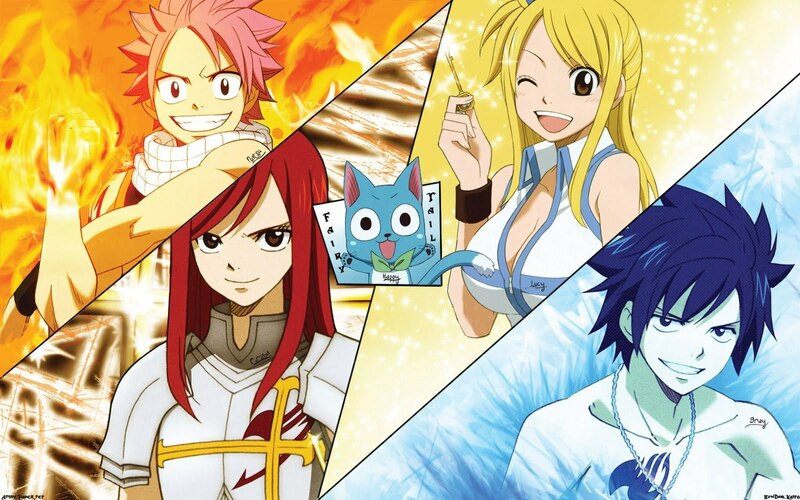 The story follows Lucy, a young wizard who wants to join the Fairy Tail Guild. She soon encounters Natsu, a Fairy Tail member and practitioner of the ancient Dragon Slayer Magic, as well as his partner Happy, a magical talking cat. After accepting Natsu's offer of membership into Fairy Tail, Lucy and Natsu team up to undertake various missions. Wendy and Charle find Erza and Jellal together. When Zero was firing Nirvana at Caitshelter, one of its legs got destroyed and misses the guild. The Blue Pegasus, Christina is back and is being held up by Lyon, Sherry, and Ren. Hibiki tells them how to stop Nirvana: destroy all 6 legs at the same time and he downloads the locations of the lacrima into their minds. Ichiya, Erza, and Jellal have only 20 minutes to destroy it. The three cannot keep hold of Christina and it is losing altitude. With encouragement, Natsu, Lucy, and Gray finally stand up and agree to go to a lacrima to destroy it. Natsu goes to Lacrima 1 where Zero is and attacks. Jellal regains memories on Natsu and goes to Lacrima 1. It ends with Jellal hitting fire at Natsu and smiling.